LLH [Landsforeningen for lesbiske, homofile, bifile og transpersoner] works to ensure that persons who are being persecuted because of their sexual orientation, gender identity and/or gender expression will be granted asylum in Norway, but we do not give legal aid in individual cases. There are two other NGOs which give legal aid to refugees, including LGBT: NOAS and SEIF. LLH focuses on working politically and structurally. 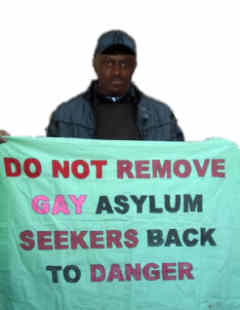 LLH has advocated for guidelines for the case workers in asylum cases concering sexual orientation, gender identity and/or gender expression, which the Ministry for Justice has promised will be ready in March 2011. We also propose training of immigration personnel in LGBT issues. It is possible to obtain refugee status from Norwegian immigration authorites on the basis of gender related persecution, also for lesbian, gay, bisexual and transgender (LGBT) persons. It is not easy, though. We present here some information and recommendations based on our own and experience together with those of other Norwegian NGOs working with LGBT asylum seekers. The application procedure is rather complex, and can only start once you are on Norwegian territory. You can find more information about the procedure and requirements on the website of the immigration autorities, UDI. It is a requirement for obtaining protection (asylum) that one is in danger of being persecuted in the future. This means that past persecution is only one of several factors in determining whether the fear of persecution in the future is "well-founded". "Persecution" means severe breaches of the UN human rights conventions. For more information about what this implies, you can visit the website of Amnesty International, or the Norwegian immigration authorities. If it is possible to avoid persecution by finding another place to live within your home country, Norway is under no obligation to grant you protection. The applicant him-/her-/hirself has the main responsibility for proving that their fear is "well-founded". This includes both providing relevant and good general information about the human rights situation for LGBT people, and information about one's individual case. Many who are persecuted on the basis of their sexual orientation, gender identity and/or gender expression, do not really know much about homosexuality or transgender issues, they only know that they are different, and suffer. Deeply felt shame prevent and/or distrust towards public officials many from telling the real reason why they are seeking protection, in the hope that they will not need to tell anybody. When such information comes late in the process it is often difficult to convince the authorities of its authenticity. LLH strongly recommends any person seeking protection because they fear persecution related to their sexual orientation, gender identity or gender expression, to tell the real reason behind their application. You may ask for anonymized interpretation, or a female interpreter, or other solutions so that you may feel safe enough to tell your real story. The authorities are bound to try and meet your requests if possible and not overly costly or difficult. Try and provide as much and reliable documentation as possible about the general situation of LGBT persons in your home country. Try and provide as correct information, with relevant documentation when possible, about your individual claim. This is brilliant! More like this, please. Perhaps you could advertise on http://onlinevolunteering.org/en/index.html to find translators who would put these resources into, oh, at least Arabic and Spanish, so that they can more easily be found & used by people in those countries which are the countries of origin for a significant number of people seeking LGBT-related asylum? i spoke with LGBT in norway and the told me my case is hard what can ido now ?